Infiniti’s sporty crossover shows much muscle. It is a privilege to receive new cars every week for test drives. My weekly drivers range from plebeian subcompact hatchbacks and humble sedans to flamboyant sports cars and natty luxury barges. Crossovers compose about half the vehicles tested — such is the growing popularity of today’s utility vehicles. 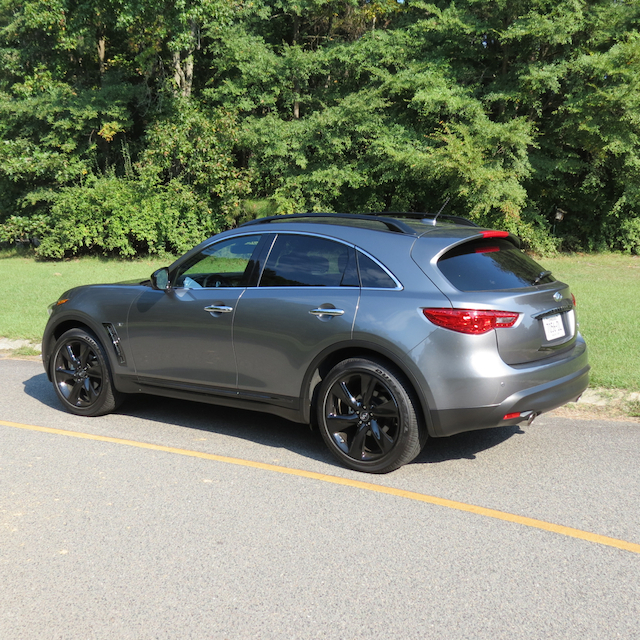 A 2015 Infiniti QX70S was a recent driver, a midsize luxury crossover utility vehicle seating five. Unlike most crossovers, this one offers standard rear-wheel drive, giving it improved handling characteristics and better driving feedback than most models in its class. All-wheel drive is optional, but if you are the type of driver who prefers a traditional rear-wheel drive layout, the QX70 should be considered. The QX70 was formerly the Infiniti FX. That was before Infiniti’s entire naming convention was changed at the start of the 2014 model year. This was my third FX/QX70 model over the past four years, so its muscular frame and persona were already familiar to me. Like the current tester the previous two were also outfitted with rear-wheel drive. That frame is marked by a pronounced grille, wrap around headlamps and tail lights, a massive hood and arched wheels. 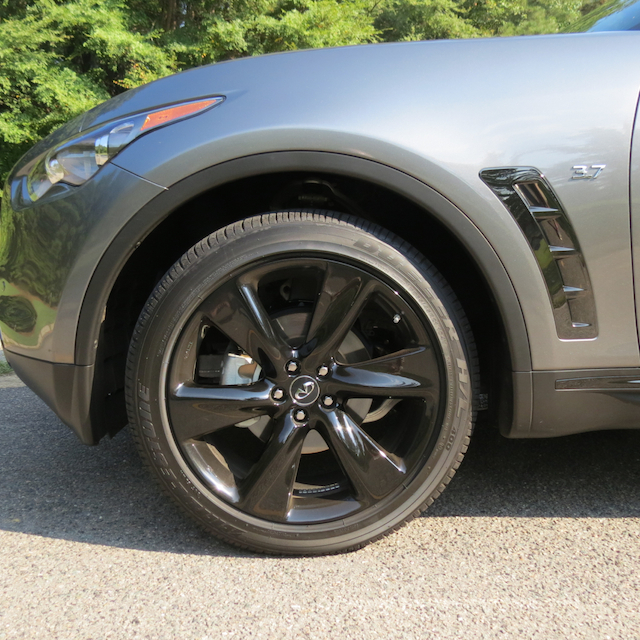 The QX70 earns its “S” appellation through a $3,500 sport package, what brings in 21-inch, 6-spoke dark finish wheels and other “dark” highlights. The dark theme extends to the interior where contrasting stitching, a dark headliner, magnesium paddle shifters and aluminum pedals are provided. Its a special look that adds “pop” to the interior. 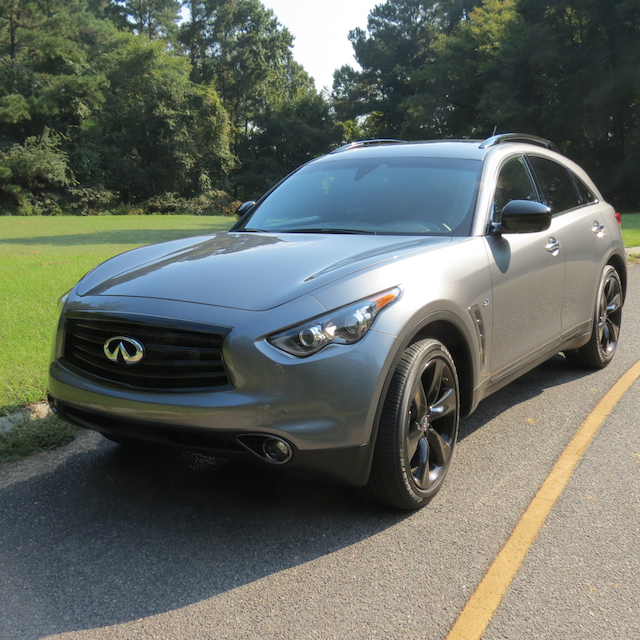 Infiniti sells the 2015 QX70 from $45,850. As tested, the crossover retails for $58,085, bringing in the sport package as well as technology ($2,950) and premium ($4,300) packages. Stylish illuminated kick plates added another $440 to the price. Choose all-wheel drive and your final price could top $60,000. There is one word that aptly describes this crossover — stout. That descriptor goes beyond its handsome looks to tell you that under the hood is a capable, powerful V-6 engine making 325 horsepower and 267 foot-pounds of twist. It provides more than sufficient kick to take this CUV down the road with authority. Infiniti pairs this engine with a seven-speed automatic transmission — shift it into sport mode and use the paddle shifters and you may forget that you are driving a crossover. It represents the lone powertrain combination for this model — you do not need nor will you want anything else. Figure that the QX70S can serve as the answer to young families that must give up a Nissan 370Z or other sports model to make way for the new baby. Sure, no crossover can match the drive fun of a sports car, but if you can supply a sports car feel in a crossover as Infiniti has done, then you can attract interested parents despite its elevated profile. On the road, the Infiniti QX70S moves off the mark with confidence and authority. Around town, you’ll be able to squeeze this CUV into most parking spots with ease. When taking to the open road, move into sport mode, turn off stability control and you will see what this vehicle can do. Its beefy tires, independent front and rear suspension, and stabilizer bars front and back work with its rigid body to produce solid handling and confident control. 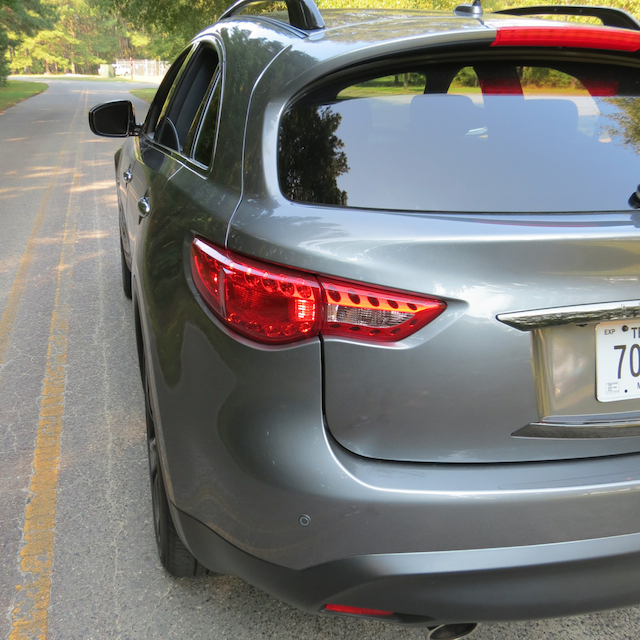 Power-assisted rack and pinion steering enhance driver feedback — although the QX70 isn’t a sports car, you’ll feel planted — and that is not something you usually find in the typical crossover. Inside, Infiniti keeps things simple, making use of traditional tachometer and speedometer analog read outs, what flank a digital driver’s information display in the instrument panel. Cruise and secondary controls are located on the steering wheel and other driver controls such as tailgate movement, traction control and side mirror operation are present on the lower left side of the dashboard. The center console offers a clean layout marked by an 8-inch color display. A command dial located immediately below that display controls all functions to include: radio, navigation, maps and electronic devices. Separate switches and buttons below that manage music and climate functions. A small compartment at the base of the console offers storage and 12-volt connectivity. Located between the front seats is the transmission stick, seat heating and cooling controls, a pair of cup holders and a covered storage compartment with a USB port, 12-volt outlet and an auxiliary input port. To the rear, this Infiniti offers very good room for three people. You get a 60-40 split folding rear seat — handles located on the sides of the storage compartment send one or both parts of the seat down. The seat does not fold entirely flat, but comes in close enough so that you can make good use of 62 cubic feet of expanded storage capacity (24.8 cubic feet standard). 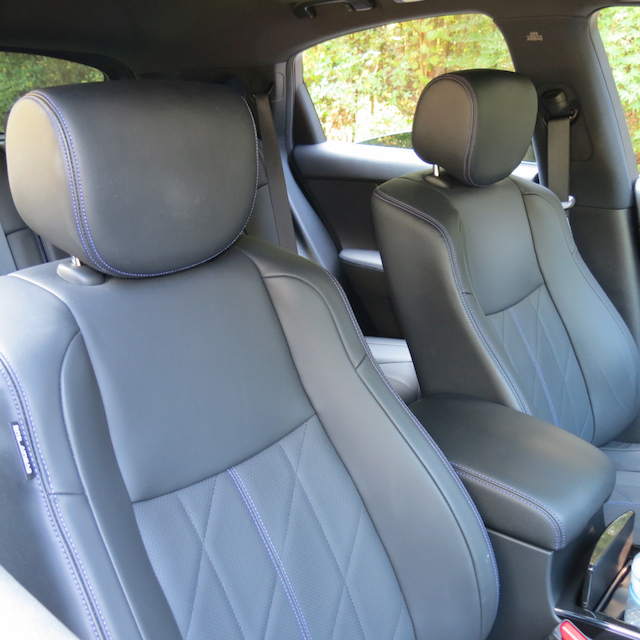 You can also fold down the middle rear seat position to find a pair of cup holders and a covered storage compartment. 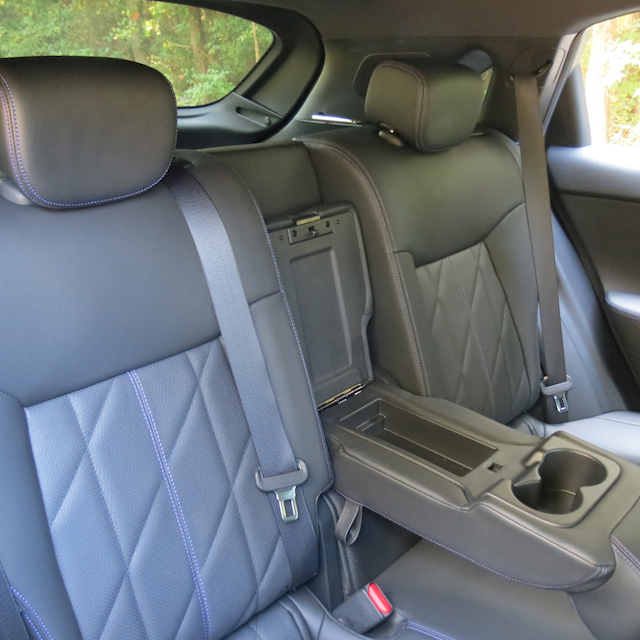 In total, you get four drink holders — there are no bottle holders in the front door storage compartments. The rear doors offer no storage compartments. 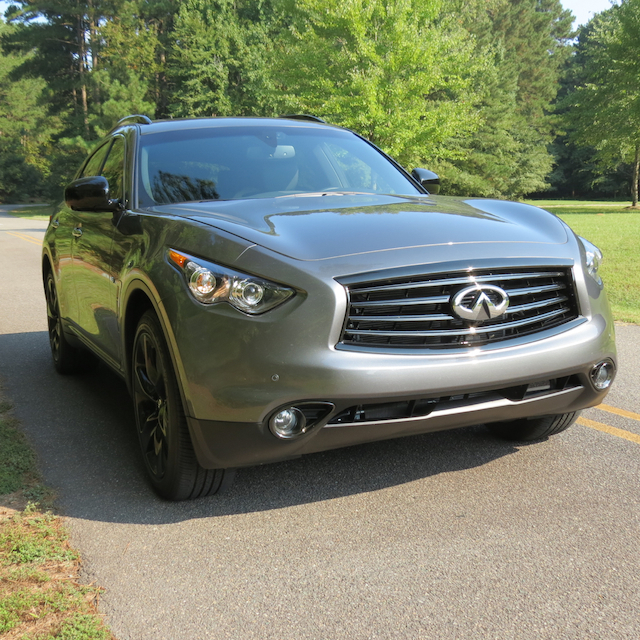 Infiniti offers a long list of standard and available features with the QX70S. This vehicle comes with keyless entry, push button start, a leather-wrapped gearshift knob, leather seats, power adjustable front seats, a tilt and telescoping steerage wheel, sun visors with illuminated vanity mirrors, driver and passenger seat back pockets, an 11-speaker Bose audio system, power accessories, a rear view monitor, as well as power folding and heated side mirrors. The technology package adds in several safety features to include: intelligent cruise control, lane departure warning, lane departure prevention, distance control assist and forward collision warning. The premium package brings in the navigation system, the color display, aluminum roof rails, a power-operated steering column, reverse tilting side mirrors, streaming audio and traffic and weather reports. A deluxe touring package brings in 5-spoke, 20-inch wheels, maple interior accents, quilted leather seats and a tonneau cover. Understanding that the QX70 may not appeal to all, Infiniti also offers the similar-sized and newer QX60. The QX60 comes across as less sporty, but has more utility along with standard front-wheel drive and available all-wheel drive. You also get an extra row of seats, providing room for up to seven. Thus, the quandary you may face is whether the fun-to-drive characteristics of the QX70 trump the practicality of the QX60. Personally, I would go with the performer. 2015 Infiniti QX70S photos copyright Auto Trends Magazine.